On a baseline inbounds, everyone sets up quickly except the inbounder, he should get the ball as slowly as possible, deeper than the end line. Start the action when the inbounder is handed the ball, he does not look at the referee. 2 screens 5 who screens 3, 4 screens 2. 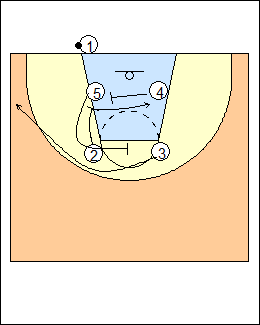 4 can post on an inbounds pass to 3. 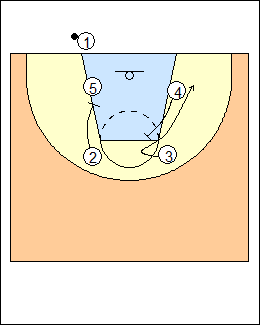 If a safety pass is made to 5 out top, 3 comes up for a hand-off, or the point guard can come out to get the ball after making an inbounds pass. 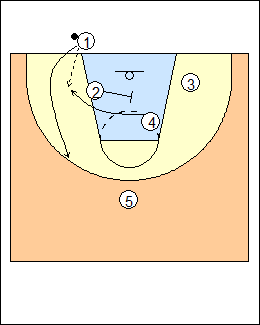 Have a set location to pass the ball in safely if the inbound count gets to four or the inbounder senses trouble, one player is designated as the safety, he releases to the location as the pass is in the air. A second safety pass option is to a player posting, hold the seal until the pass is made. The same play out of a line set, 4 pops and screens 2. Use deception, make it look like you have more inbound plays than you really do. Also use a hot signal for a game, designate the first or second number of a play call as the actual play, e.g., if the play is 1, call 12 or 15 if the first number is the hot signal, call 31 or 71 if the second number is the hot signal. 2 screens 5, 4 screens 3 (who may be open going to the rim). 2 screens 4, 5 is safety. 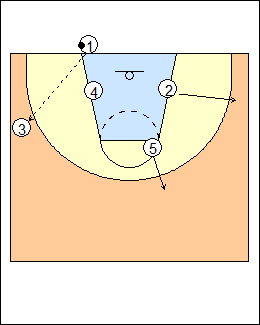 Post iso - 1 inbounds to 4 then runs around him (shown).